A very few absolutely essential pictures that you probably need to look at if you want to be a complete person. 1. A corgi bringing joy to an elderly man she just met. 2. A meerkat and a dog who are totally comfortable with their friendship and frankly wondering why you are looking at them like that. 3. A kitten animatedly explaining her opinions to a disinterested rabbit. 4. 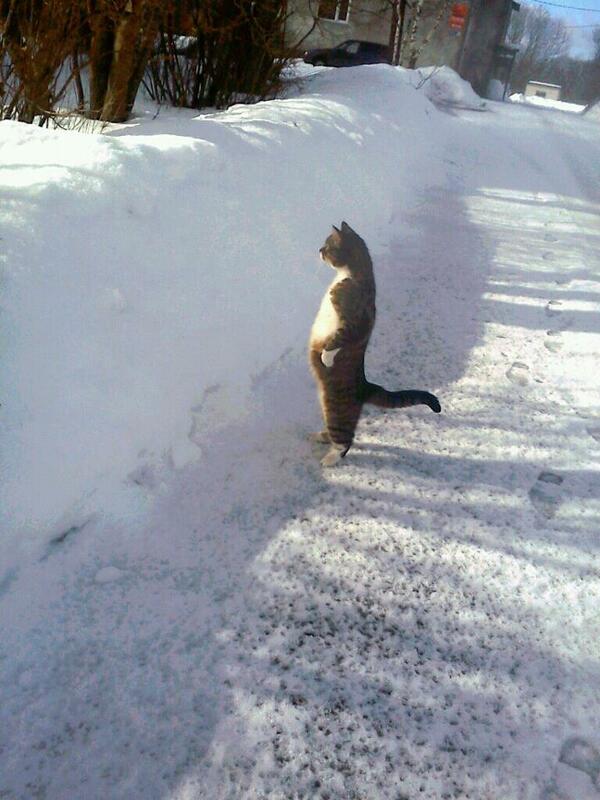 A rare snowcat general surveying her territory and weeping "because there are no more worlds to conquer." 6. A big dog carrying a little dog in a basket like it's the most natural thing in the world. 7. 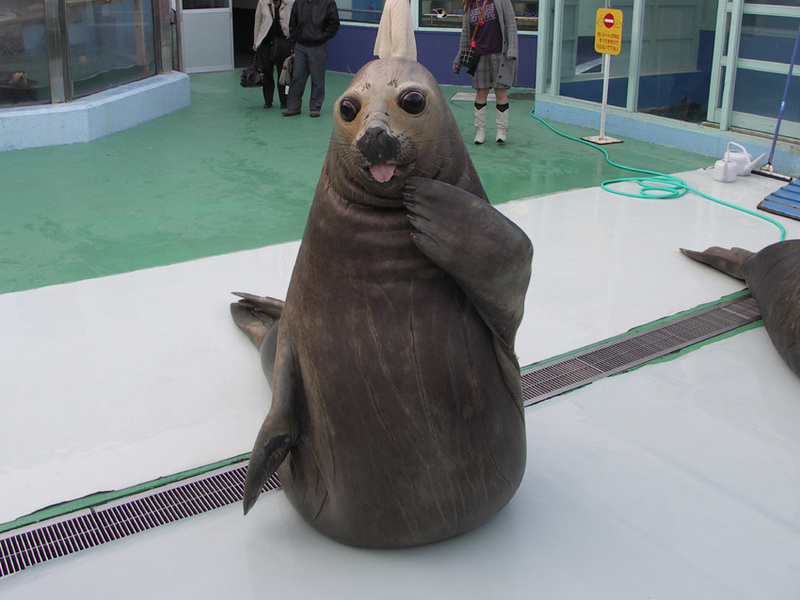 A seal in the act of saying, "Who, me?" 8. An orphaned pony whose best friend is a teddy bear named Button. 9. A very serious rabbit wearing bunny slippers. 10. A dog who is taking a "sick day" to spend more time with his penguin. 11. A protective dog spooning with a baby. 12. A baby bear giving a suspicious dog a kiss. 13. And a giraffe reaching over a fence to tell a secret. 14. A rabbit who is surprised to find that he is in love with a puppy. 15. Two geese and a dog having a business meeting. 16. A cat who is having the best day ever. 17. And a cat who has just taken a massive leap forward in relaxation innovation. 18. A Great Dane who is friends with a fawn. 19. And a kitten who is friends with a fawn. 21. Two grown-up horses who are having a business meeting with a young entrepreneur. 22. The happiest Siberian husky couple on the planet. 23. A lemur who has discovered the wondrousness of cupcakes for the first time. 24. Two dogs who put aside their differences to pose for the camera. 25. This puppy in a onesie. 26. THIS puppy in a onesie. 27. And this puppy in a onesie with duck slippers. 28. The luckiest girl in the world taking a bath in puppies. 29. A kitten expressing surprise at the size of a lady's hand. 30. A husky dinner party that's gone on until the wee hours of the morning. 31. Two friends sharing equal credit for capturing a stick. 32. The cutest kitten in the whole wide world. 33. A cynical tiger, reluctantly accepting a kiss. 34. A momma hippo "booping" a baby. 35. A cat drinking upside-down from a faucet. 36. The happiest bear in the world. 37. Two friends who are pilot and co-pilot of a filing drawer. 38. Five baby pandas drinking milk out of giant bottles. 39. The best, most effective pile of kittens ever. 40. One of the world's most dapper cats on his way to a formal event. 41. Twin cats who have discovered a tiny novelty bunk bed. 42. A monkey who is having a very happy birthday. 43. The extremely rare, perfectly executed "triple hug." 44. Two baby bunnies sharing a kiss. 45. A baby saying, "Oh, you!" to a cat. 46. A retiring school dog who got into the senior section of the yearbook. 47. A puppy who is convinced that she is a 50%-off "Beanie Boo." 48. The happiest toddler in the world hanging out with a philosophical dog. 49. A dog who is pleasantly surprised to discover that he has adopted two baby rabbits. 50. A red panda trying to open a door. 51. And these baby geese leaving the nest for the first time.